It’s Verizon’s big day: Apple’s iPhone 4 arrives to the network on Feb 10, ready to steal millions of unsatisfied customers from AT&T and launch Apple’s share price into the stratosphere. It’s Verizon’s big day: Apple’s game-changing iPhone 4 has arrived to its network, ready to steal millions of unsatisfied customers from AT&T and launch Apple’s share price into the stratosphere. We’ve read reams of speculation about the Verizon iPhone, and McAdam obviously knows how to work a crowd. He set the stage by noting that, “We’ve made network quality the hallmark of the Verizon brand” and that Verizon has “the only infrastructure that’s future-proof, and we can deliver high-def and 3-D content over the 3-G system robustly.” It was an unmistakeable dig at the data and call-drop woes that the iPhone has caused AT&T and a subtle promise that the mobile broadband future that Apple helped usher in will work reliably on Verizon’s network. Then came the big reveal: “Today we’re brinigng to market the fruit of our strategic partnership with another giant of the high tech industry, and that’s Apple.” The iPhone is coming to Verizon, officially, on February 10, 2011. Verizon’s also teasing an “exclusive opportunity” where existing customers can “get an iPhone 4 from our reserved quantity before they’re available to everyone else.” This offer requires customers to sign up from February 3rd onward, a week before the phone officially arrives in stores. 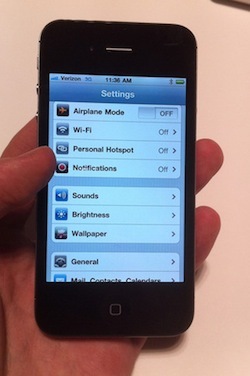 In a maneuver that will enthrall millions of AT&T users, the iPhone 4 on Verizon includes the ability for the phone to act as a Wi-Fi hotspot, allowing up to five other Wi-Fi users to utilize the iPhone’s 3G data connection. It’s unclear whether or not this capability will be included in the data plan, however. It’s also a phone that you can roam with, but there’s no SIM-tray–meaning that GSM compatibility seems to have been edited out from this version of the iPhone, thus limiting the phone’s roaming capabilities to the 40 nations that have some CDMA network support. This also means that the leaked iPhone chassis that hit the news recently probably really is the iPhone 5: This new Verizon edition seems to have the same antenna adjustments seen on that model, but lacks a SIM slot. The antenna tweak to support the slightly different radio frequency engineering needed by CDMA also seems to have completely banished the antennagate effect: We saw no bar-dropping when we tried the famous “death grip” on the modified Verizon iPhone. Though this is just one unit, demonstrating one user example (and the effect isn’t replicated at all times by all users) it’s definitely a very strong hint that Apple’s carefully designed out the antenna bugs. What Verizon didn’t reveal today was any data on tariff pricing. When we asked why, they were pretty blunt: “As soon as we have an offer in the marketplace we’ll announce the pricing.” This may be a counter-move to keep AT&T from making an immediate tweak to its pricing structure–before the iPhone on Verizon hits the shelves–in a bid to keep its own iPhone subscribers inside its embrace. AT&T may also get something of a boost here, because though many people have been eagerly awaiting the Verizon iPhone, market watchers know Apple’s update schedule for the iPhone means a new iPhone 5 will probably arrive in the summer–not too many months into the two year lock-in that a Verizon subscription requires. What also didn’t happen today was a presentation from Steve Jobs. Rumors had suggested he might arrive, but instead he left it to his new right-hand man (and temporary sick leave stand-in) Tim Cook. 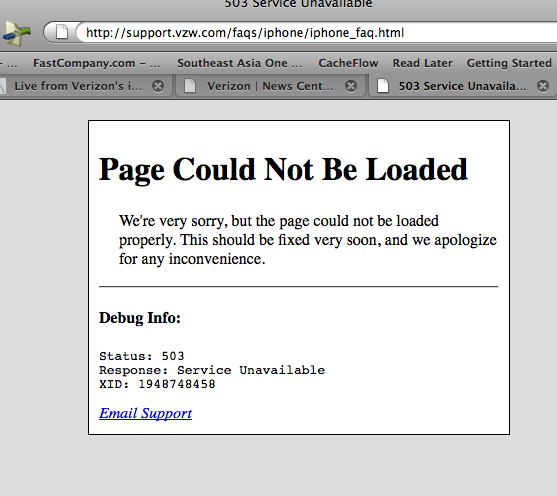 And in a sign of just how popular Verizon’s iPhone 4 is likely to be, the support site that includes the FAQ for the new phone crashed during the announcement–despite being part of America’s Most Reliable Network. Reporting from the event by David Zax.